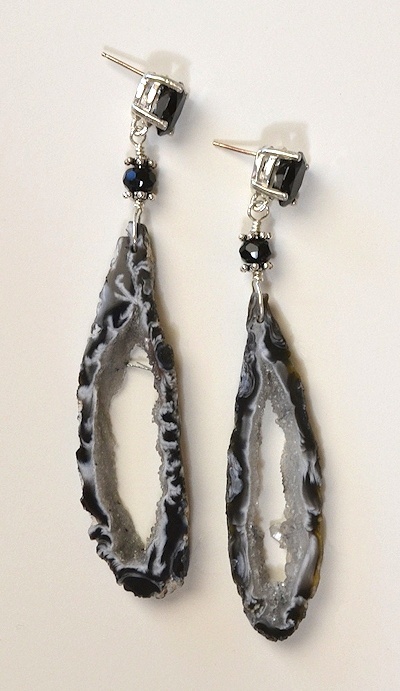 These dramatic earrings are "fraternal twins," slightly different because they are natural shapes cut from the same black and white agate geode. "Oco" means "hollow" in Portuguese. The inside of the geodes, like most hollow ocos, are filled with tiny clear drusy quartz crystals, including one lovely larger crystal in the right-hand earring. The wavy black, white and grey patterns are typical but thus far unexplained scientifically. Cross and Zeitner (see below) show interesting photos of the area where these beautiful stones are found, also of piles of the uncut stones. They discuss them in some detail. Their book is a wonderful resource for anyone interested in geodes. There are large natural black spinels on the posts. Spinel is a magnesium aluminum oxide mineral with a cubit crystal system. It takes an extraordinary high polish and looks like black diamond. Simmons and Ahsian say it is a stone of revitalization. Please note that the earring model is smaller than life-size, so if you have an interest, I urge you to check the size (given at right) on a ruler to get an idea of how they will look when worn.